HWS AOD Project- US Dept. of Ed. "Model Program"
The goals of these competitions, sponsored by the U.S. Departgment of Education's Office of Safe and Drug Free Schools, are to identify the most effective programs of alcohol and other drug prevention at institutions of higher education that can serve as models for the nation. Grants are provided to selected institutions to further enhance their programs and disseminate information about these programs to other colleges and universities. 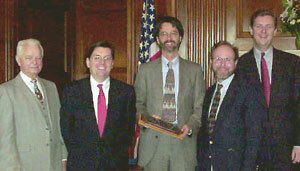 The grant program began in 1999 and schools are eligible for consideration every five years. Hobart and William Smith is the only liberal arts college along with 26 universities selected to date and only one of two schools nationally to have received the honor twice. 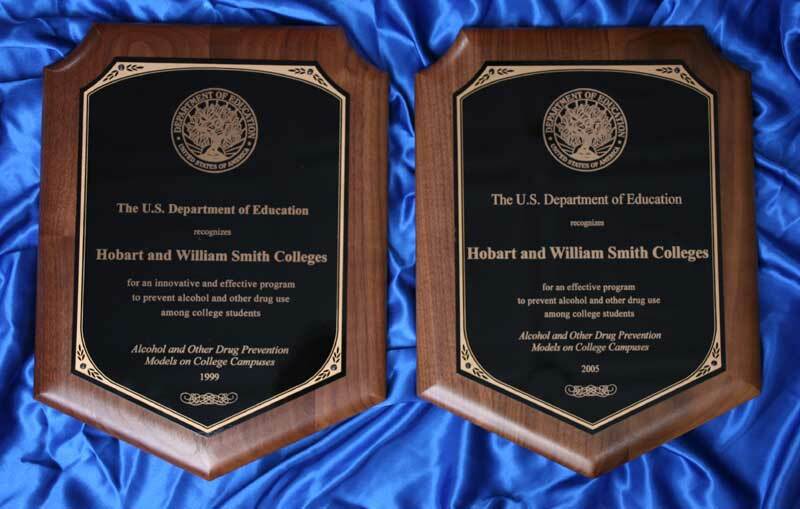 Professors Wesley Perkins and David Craig traveled to Washington, D.C. on Monday, March 27, accompanied by President Mark Gearan, to receive recognition for their work in alcohol education on college campuses. 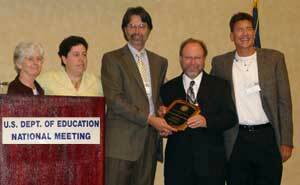 Professors Wesley Perkins and David Craig traveled to the U.S. Department of Education national meeting in Indianapolis on Monday, October 3, accompanied by David Diana, director of the Office of Alcohol and Other Drug Programs, to receive recognition for their work in alcohol education on college campuses. Wesley Perkins, professor of sociology, and David Craig, professor of chemistry, recently received a grant of $74,454 from the U.S. Department of Education to continue and enhance the Alcohol Education Project, a project they direct that has been previously supported by the Department of Education. The Project provides education and prevention initiatives addressing alcohol use and abuse for the HWS community, regional coalitions of high schools, and institutions of higher education nationwide. This most recent grant is part of the "Model Programs in Higher Education" competition designed to identify the most effective programs in the country. Competition winners will have their programs promoted at colleges and universities and also at high schools throughout the country. 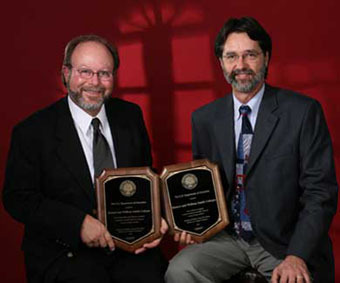 David Craig, professor of chemistry and H. Wesley Perkins, professor of sociology, recently received a grant of $95,500 from the U.S. Department of Education to continue and enhance their Most Valuable Players program that promotes positive norms, reduces harmful misperceptions, and reduces high-risk drinking and its consequences among student-athletes (see http://alcohol.hws.edu/mvp/index.html). The program achieved success by significantly reducing misperceptions of norms, high risk drinking, and related negative consequences while increasing academic engagement (see http://alcohol.hws.edu/mvp/Results.html).